My current favourite building. Old, definitely decrepit, but there is something about this building that I just really like. Is it the proportion? The colour? The fact the paint is peeling off? Or just the two iconic, muscular, male figures doing hard work over a stark white anvil? I can only presume that this was once a house for the Unionists in Wellington, going purely from the sculpture (backed up by the colour, of course). Never been in here. No idea if it is an earthquake risk or not. It is clearly uncared for, but does that mean it is on the down and out list? So much better than the mirror-glass monster next door (that honestly should be demolished immediately), Anvil House still seems to be on the radar as a home for creative companies. Best seen with the light glancing across the facade at about 3pm. Yes Anvil House has always been a good looker. IIRC, Trade Me were based there for a number of years before heading over to the Odlins / NZX building. John, any idea who the architect was of Anvil House, or when it was designed / built? In terms of time, I’m guessing it is more 1950s rather than 1930s, but I haven’t done any homework on it yet. In terms of architect – who could it have been? It’s not likely to have been a Toomath, Alington, Beard and Wilson building, not likely to have been a Structon number. It’s a quirky number – needs a quirky architect. In terms of Jean, no idea. She just up and went. Oi! just noticed that “We need to speak about Jean” has been cut. You losing the thread? Oi Starkive! Ahoy there! You’ll know about this building, won’t you? There’s not much that slips past you. It’s similar in a way to Congress House in London, which was designed in 1948 (by architect David du Roi Aberdeen, who I’ve never heard of either…) but only opened in 1958 (with a great sculpture outside). My guess is therefore that the NZ version of this would be late 40s / early 50s too. Re Jeans? Too many slashes, fell right off the pedestal. 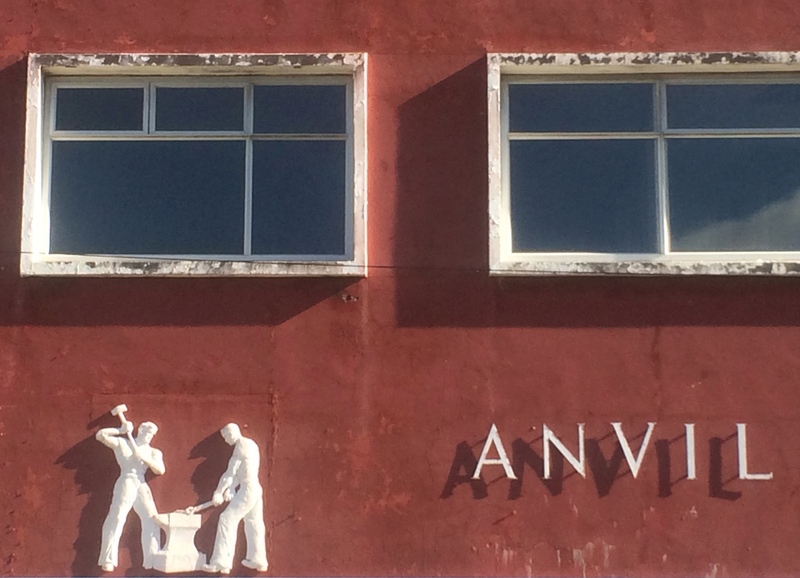 Google tells me “Anvil House (archt: J. Lindsay Mair, 1952)” but doesn’t have early history of Smith & Smith that would explain picking the obvious blacksmith logo. Thanks Paul – you must have a better google than me, as it didn’t tell me any of that. What is the reference to Smith & Smith? Were they the original tenants or something? Does that mean that I am reading the logo wrong? I’m picking up vibes of “the Worker” there, and hence thinking that this was a building for the Unionists – maybe I’m wrong. Or are you just meaning the literal: Two blacksmiths? “Kelly & Mair, architects :Messrs Smith and Smith Ltd., “Anvil House”, Wakefield Street Wellington. 1951. So, the reference of the bas-relief sculpture of the two blacksmiths really was (perhaps an in-joke) a Smith and Smith thing, not a Soviet Union era “Workers of the World Unite” sort of thing. Ha! I was completely fooled. Another record at Nat Lib says : “Haughton, Son & Mair, architects :Proposed offices at Anvil House, Wellington. [1954? ]” which is presumably a fitout only. “Anvil” was Smith & Smith’s paint brand. and the building facade is different again. I too have always liked that building, possibly because during some of the sixties my father worked upstairs in it. Where the scooter shop is now was originally a loading bay, and that, along with the almost slit windows that could have come from a domestic dwelling gave it a purposeful but human scale look. And the glass blocks in the entrance, repeated as oversize ones up the stairwell are lovely. It doesn’t appear on the WCC earthquake prone list released this month so there’s hope it has a future. William – those references are fantastic, thank you! So, what I’ve also learned from them, is that Smith and Smith sold paint back in those days (no mentions of car windscreens back then) – paint for roofs, in two colours: both red and green Steelite paint. I’m presuming that it was made of reinforced concrete, not brickwork, and so therefore it shouldn’t be on any endangered species list. Might well not be 100% of code, but at least it is not likely to be less than 33% NBS. Significance The first inner city office building built in Wellington post World War II. An accomplished work by a significant firm of Wellington architects. References “”Anvil House”, Wellington” Journal of the New Zealand Institute of Architects (October 1955) 22(9):185-189. Kernohan, David Wellington’s Old Buildings (Wellington: Victoria University Press, 1994) p. 178. PS if you put in an alias why doesn’t it get used? I recall their Cuba Street retail shop was on the East side, maybe the second up from the Wakefield St intersection. I think there was access at the back of the shop through to the loading bay of Anvil House. A bit OT but searching the Evening Post via paperspast for “Smith and Smith” brings up many advertisements and other stories. which gives an idea of their range of business. 24/7/30 A sale on kettles. William – Fourteen days in prison for steeling a mirror…. harsh times back then. Re your query about an alias – I’m not sure. The person who built the website has long gone and I don’t know how to change that – most people just put an alias in as the ‘Name’ but I don’t mind if you use an alias or not. Gone past today – building appears to be being painted white…. could be the undercoat, but that red has gone from the front face…. Its Red but a little less chalky. Looks good.